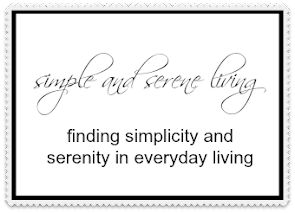 F Simple and Serene Living: you paid what? If you have been a reader of mine for any length of time, you know that I LOVE auctions. Did I emphasize that word LOVE enough? I not only go to auctions for my business, but I am also able to find things at really good prices for myself. I don't often shop for furniture, but a couple of months ago there was a wood dressing table that I wanted to purchase and use for a desk in my bedroom. It was perfect and so I went back in the evening for the furniture sale. I'll share that at a later date, but what I want to BRAG ABOUT share today is one of the other things I got. Can you tell that I am still giddy even after two months? 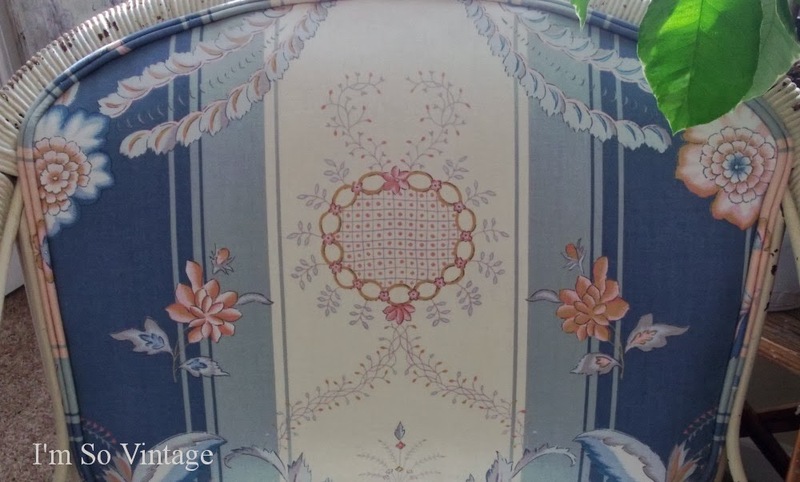 and beautiful predominately blue floral print fabric. You may have already guessed that it is a fabulous wicker chair. I believe it dates from the 1930s to 1940s and it is in great condition. 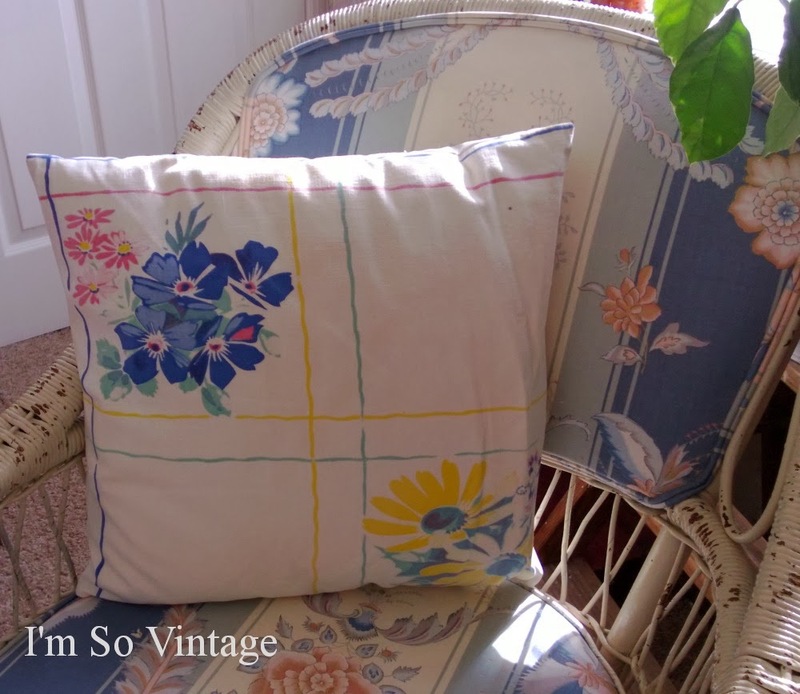 This pillow I bought from a thrift store is perfect on it. So I stole paid what for this chair? FIVE DOLLARS!!! Yes, you heard me correctly. FIVE DOLLARS!!! It would be hard to top that deal. I'll show you where I put it when I share my desk. That's a hint. Oh my I would be giddy forever! what a find, love love it! 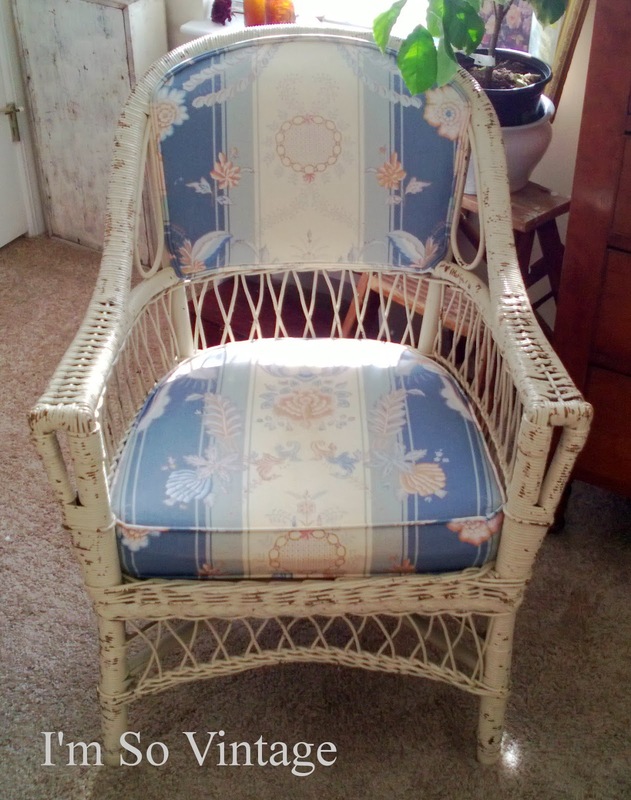 The wicker chair was a wonderful find! The pillow is perfect with it! Now that's a deal to get excited about! Love, love the chair.....did I mention love the chair? That's one steal of a deal...looks gorgeous. Oh my goodness, Laura, that is AMAZING! The upholstery on it is so beautiful along with the chippy finish! That is a really beautiful find, Laura! Good for you. I love the toss cushion too. It's all very pretty. WHAT A FIND! Good for you! I cannot believe it was only five dollars! That was a steal and I would have snapped that up too. WooHoo! Great score! It's the thrill of the hunt. What a GREAT piece!! That was a great buy! So glad that you found that and have a place in mind for it. Laura, just stopping to say hello. We won't have Internet until the 13 th so am limiting what I do with a iPad. I always have room for oldies but goodies. What a great deal for that lovely chair! It's gorgeous...but you already know that! What a deal and something you'll use and enjoy! Hugs!